Luke Combs is coming to Kat Country! Get your tickets to be a part of the “Beer Never Broke My Heart” Tour!! 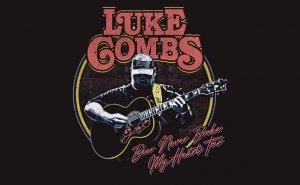 Kat Country, Luke Combs is coming to the SAP Center on November 6th, 2019! 🎤 Tickets are on sale NOW!!! Click right here! OR click on the graphic to be taken directly to the virtual box office! Make sure you listen to DJ Walker in the Morning to win ’em before you can buy ’em!! !